Perhaps Steve Tisch is better known as the Chairman and Executive Vice President of the New York Giants which has been in His Family for almost 30 years. 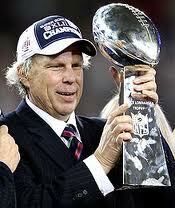 Tisch took over the reigns in 2005 and has become a very active Pro Football Team Owner winning two Super Bowl Rings. But it's not the New York Giants Steve has a 50% interest that's made him a billionaire, instead it's the Mega Hit Movies Steve's been involved in producing and a Family Fortune His Dad helped create. The list of Hit Movies Steve Tisch has produced is a very impressive list indeed. Does anyone remember a Movie called Forest Gump starring Tom Hanks? Or perhaps you may remember a little Movie called Risky Business that put Tom Cruise on the map and made him a Mega Super Star. The list of A-List Celebrities that have worked with Tisch reads more like the Celebrity Guest List at the Oscars, they are all there. Having a passion for producing Movies came at a young age for Steve. In 1986 at the age of 37, he branched out on his own and started the Steve Tisch Company. Eventually his company would merge with Black Blu Production's owners Todd Black and Jason Blumenthal, and form Escape Artist's. Tisch still remains active in this Company to this day. Escape Artists specializes in independently financed film production's based at Sony Pictures Entertainment. This is the same facility where the Shark Tank Show is also made and produced. John Travilta, Will Smith, Nicolas Cage and Denzel Washington all have one thing in common, they have all worked with Steve Tisch and tremendously benefited from doing so. Steve is the only person on this planet that has Won an Oscar and a Super Bowl Ring multiple times. By making a deal with Tisch on the Shark Tank Show, hard telling who else you might meet and become friends with. As the saying goes it's not what you know, its who you know when trying to get those doors pried open for the first time. Steve certainly has a lot of doors he can open with just a single call covering several different industries. I can only imagine the names and numbers Steve has in his smart phone who he can freely call anytime and put you in direct contact with the Best of the Very Best. What Is Steve Tisch Net Worth? The entire Tisch Family Empire is valued over $21 billion combined. Steve's Net Worth will continue to grow in value with the Family Fortune invested in companies such as Lowes. The Tisch Family Empire is also very well known for their philanthropy work already giving hundreds of millions to Charities and Foundations around the world. In 2011 the New York Giants were the fourth most valuable team in the NFL valued at $1.3 billion. (They have since then won another Super Bowl Championship) Tish has a 50% ownership stake in the Giants along with John Mara who controls the other 50% of the NFL Team. Including Steve's interest in Escape Artist's Productions and a few other companies he's involved with, Steve Tisch's Personal Net Worth is estimated at $1.3 billion dollars. Yet another billionaire added to the Shark Tank Investors line-up that knows how to make things happen. With two Brand New Sharks added to Shark Tank Season 5 that both happen to be billionaire's, could this be the new standard when deciding on future Sharks for the Show? I'm not sure about that one, but it does give our Sharks who are now only worth millions, the opportunity and motivation to become billionaires themselves. Does Steve Tisch know a thing or two about Business? He knows everything about "Risky Business" and what it takes to succeed using creative thinking to overcome any obstacle in your way. We will be updating this page showing all of Steve's investment's made during Shark Tank Season 5 here. Stat Tuned: Shark Tank Season 5 starts soon on September 20, 2013!